Who Wants to be the Bad Guy? Last month, news of a possible real-world purge in multiple American cities spread across the internet like wildfire. Inspired by Facebook posts from Louisville announcing that all laws and emergency services would be suspended for a twelve hour period, copycat hoaxes soon popped up Jacksonville, Detroit, the Bay Area, and other major US cities. The news went viral, Louisville police took the threat seriously, and, in the end, nothing happened. While the hoax sparked fear of looting and homicide through social media and news sites, it was fortunately anticlimactic. But it raises the opportunity to discuss current events and the ideology that drives them. In particular, why anybody would be attracted to enacting a purge-like scenario in the real world? For those unfamiliar with the two-film Purge series—written and directed by James DeMonaco—the premise is simple: what would happen if citizens were granted a “purge” period for twelve hours, once a year, during which all laws, including homicide, were suspended? The result, in the film, is twelve hours of rampant looting, destruction, and killing. It’s an interesting thought experiment as to what an America temporarily devoid of the social contract would look like. Here, the phrase “social contract” refers to the tacit agreement of all citizens to follow laws in order to maintain social order. 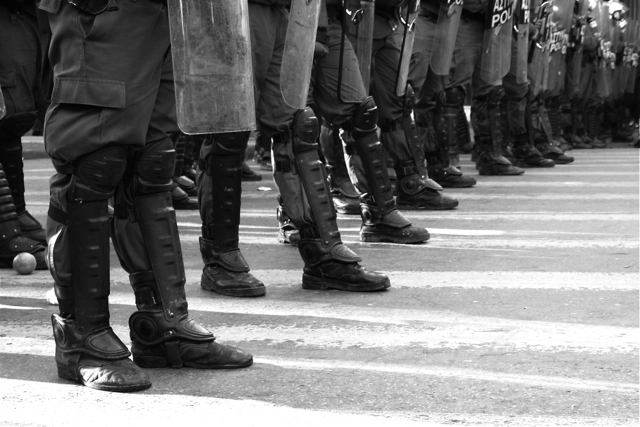 In practice, the contract is enforced either by the state—in the form of the police, the military, or structural authorities—or through social pressure. The Purge and its sequel, The Purge: Anarchy, are in many ways a modern retelling of a thought experiment by seventeenth-century philosopher Thomas Hobbes. In De Cive and Leviathan, Hobbes reasons that before mankind entered into society, life was a “war of all against all.” In order to escape from the dangers of pre-society, mankind entered into a social contract, giving up some of their freedom in exchange for security. As in The Purge, Hobbes assumed that without a social contract, mankind would dissolve into pandemonium. He states in Leviathan that life in this war is “solitary, poor, nasty, brutish, and short.” For Hobbes, the social contract meant stability and longevity, and underpins the sovereignty of the state, lest society ever revert to dangers of anarchy. In Wealth of Nations, philosopher Adam Smith expanded on Hobbes’ thought experiment, envisioning capitalism as an escape from the war of all against all. Within capitalism the pursuit of an individual’s interest unwittingly serves the interests of all, producing a “general affirmation.” Karl Marx rejected this conclusion by critiquing the thought experiment itself. In Grundrisse, Marx argues that both Hobbes and Smith envision a life outside of society from a position embedded within society—a life before history imagined from within history—and so the very conceptions of their thought experiments are tainted. Marx instead inverts Smith’s formulation by labeling capitalism itself as a war of all against all, under which each individual’s pursuit of their own interest blocks the interests of other individuals, creating “a general negation.” For Marx, capitalism is a war of all against all, and the thought experiments of Hobbes and Smith are tools by which capitalism reproduces itself. While it may seem strange to go back to Karl Marx and Thomas Hobbes in order to examine what is widely considered to be a mediocre film franchise, it is important to understand the internal ideologies at work within the two Purge films: specifically, the idea of the social contract and its necessity. Both films make it clear that the purge—the suspension of laws and government services—is inextricably linked to American capitalism. In the first film, Ethan Hawke’s character, James Sandin, transcends his working-class background by selling security systems to affluent Los Angeles suburbanites until he is able to join their ranks. DeMonaco presents Sandin as a successful capitalist, a nouveau riche, profiting through the labor of the contractors who sell his state-of-the-art security systems. However, in becoming affluent himself, this salesman inspires the resentment of his neighbors, old-money capitalists who design to kill the man and his family during the purge in order to preserve the purity of their affluent neighborhood. Although his neighbors are tolerant of Sandin’s new wealth while the social contract is in place, once law is suspended, they turn on him. These resentments are not created by the purge, but suppressed by a social contract that obligates his rich neighbors to bear Sandin’s social mobility as part of the capitalist system. Once they are no longer constrained by the social contract, however, they are free to unleash their animosity towards Sandin and, symbolically, his class background. The purity that the gentry wish to uphold is not only one of class, but also of race. Edwin Hodge plays Dwayne, a black man who is being hunted by a group of young white attackers. The group of white sociopaths descends upon Sandin’s house after his son offers Dwayne, a stranger, sanctuary in their supposedly impenetrable home. Despite the fact that there is no social contract in place to compel him, Sandin’s son makes a moral choice to save the life of another person. Where the young white sociopaths are constrained by the social contract the rest of the year, during the purge they are able to shed the illusion of having a moral code that governs their actions. They don masks to hide their identity, not from fear of being caught, but from fear that their lack of morality might be recognized after the social contract is reinstated. The son, however, displays an internalized morality that is independent from the presence of a social contract. 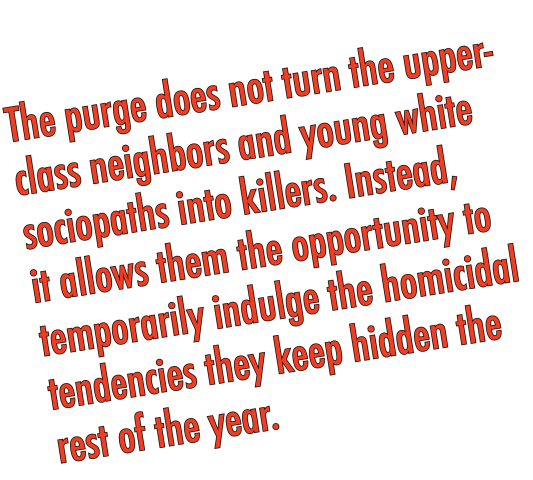 The purge does not turn the upper-class neighbors and young white sociopaths into killers. Instead, it allows them the opportunity to temporarily indulge the homicidal tendencies they keep hidden the rest of the year. Eva Sanchez is the nexus at which all of these interlocking systems of oppression meet within the second film. This is clearly demonstrated when the protagonists are captured by a hired gang and delivered to an upper-class club of purgers. People who are captured by the club’s hunters become the property of the club’s members. In the absence of a governing body or obligation to the social contract, Eva Sanchez’ humanity is stripped from her by capital. Because of her position within society, a working-class woman of color, she has limited power to resist the white, rich club members and their private security forces. It is only through the aid of anti-purge resistance fighters, led by Dwayne, that she is able to survive her capture and escape from the club. In both movies, DeMonaco presents the purge as a weapon of the status quo, the white supremacist capitalist patriarchy. Even in the absence of the social contract or government, the institutional power of rich white men gives them an advantage over those who are not. It is only when the social contract and the state are both in place that the safety of James Sandin and Eva Sanchez are secure. However, DeMonaco presents an alternative to state power in the anti-purge resistance fighters. By organizing the people who are most susceptible to the purge, he is able to exert social pressure in the place of state power. DeMonaco makes it clear in both films that the purge is by no means a good thing for anybody who is not a white, upper-class male. He portrays those who take part in the purge as villains, while depicting those who resist the purge, such as Dwayne and Eva in the second movie, as heroes. However, within the world of the movie, the purge is widely lauded. Safety becomes a commodity, and those who can afford it sink millions into the economy by purchasing security systems and firearms. The population is culled yearly, controlling over-population and scarcity. By temporarily suspending the social contract for twelve hours, by allowing unfettered brutality, the America of the film is able to secure its economic and social stability. But DeMonaco demonstrates that this economic and social stability comes at a high moral cost. Why, then, would anybody want to emulate the villains of the Purge movies? In March of this year, Cliven Bundy and groups of self-described militias prevented federal authorities from removing cattle that were illegally grazing on federal land. Cliven Bundy told a radio interviewer “I don’t recognize [the] United States government as even existing.” Bundy and his fellow right-wing protestors, many of whom were white men, were praised by the conservative media as patriots standing up against an oppressive federal government. The Drudge Report, Fox News, and Alex Jones saw the event as historic for American citizens—”American citizens” in this case meaning white, capitalist, anti-government protestors. For a few short days, Cliven Bundy was the hero of the Tea Party, Republicans, and American libertarians. Last month, a police officer in Ferguson MO executed an unarmed black eighteen-year-old named Mike Brown. Peaceful protestors marched against the police department and state government, urging them to arrest Darren Wilson, the shooter. The police responded by enacting a curfew, launching tear gas and rubber bullets at citizens (protestor and bystander alike), suppressing the media, and sneaking Darren Wilson out of the state. The Drudge Report, Fox News, and even Alex Jones sided with the police department. 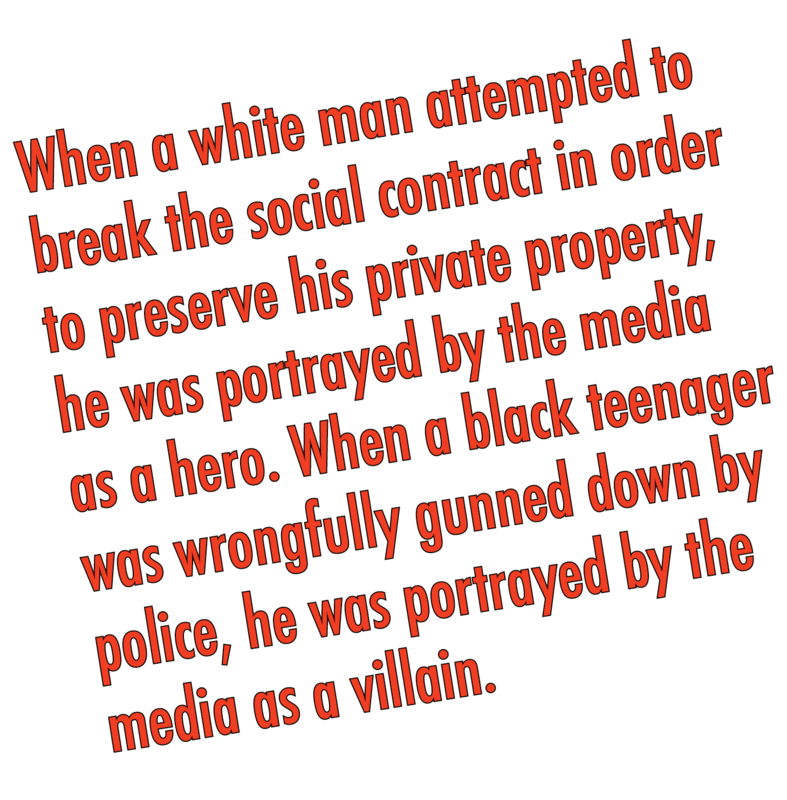 When a white man attempted to break the social contract in order to preserve his private property, he was portrayed by the media as a hero. When a black teenager was wrongfully gunned down by police, he was portrayed by the media as a villain. Which brings us back to The Purge. Why would anybody want to emulate the villains of the Purge franchise? Perhaps they imagine themselves, as Marx wrote, outside of society from within society. And white conservatives believe that the social contract is holding them back from fulfilling their potential. Without the social contract, they could preserve the purity of their white suburbs. As long as they have their guns, they would never have to worry about anyone trying to take their property from them. And without anyone to stop them, they could finally take advantage of that girl who never paid them enough attention. 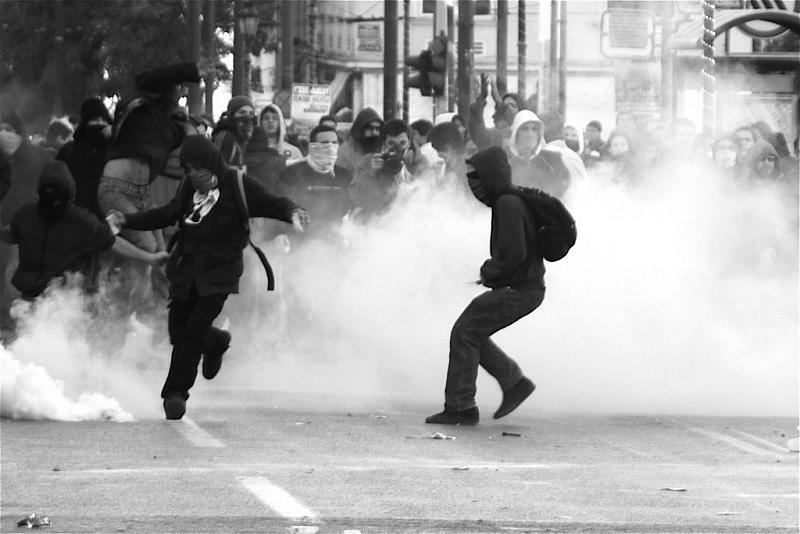 When white capitalists picture themselves during the purge, they see themselves as Cliven Bundy or Darren Wilson. They never see themselves as Mike Brown. This entry was posted in Culture, Features, Film and tagged andrew massie, Cliven Bundy, Ferguson, film, Hobbes, Louisville, marx, Mike Brown, popfront, right wing media, social contract, The Purge on September 17, 2014 by Andrew Massie.